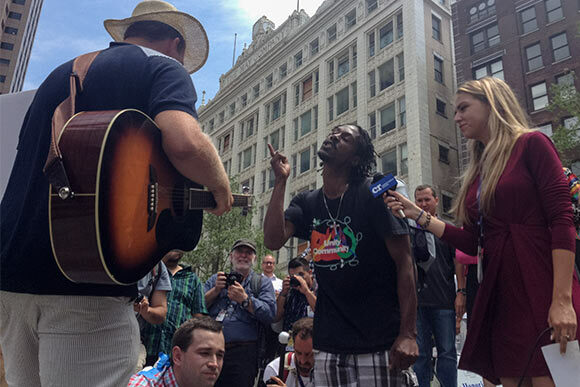 Among the rallying protesters, camera-wielding media and stiff-backed patrol officers crowding Cleveland’s Public Square during the Republican National Convention stands Gilligan, a local magician. A cross between Mr. Spock and the 1960s Bob Denver character, Gilligan in his black slacks, shoes and matching top hat, stands in front of a sign, LET’S MAKE AMERICA MAGICAL AGAIN, while performing a rope trick. Despite pro-LGBT protestors fighting religious evangelicals in the background, Gilligan goes into his routine effortlessly. “Some people are treated unequally,” he announces, displaying his three lengths of rope. “Some are treated different! But we all need to work together. Our two party system clearly does not work the way it is.” And in a blink, three ropes become one. “It’s all about unity,” he says. One of the reporters on the scene poses for a smiling photo with Gilligan before trotting off to see about a man with an American-flag wrapped AR-15 rifle. Outside of Gilligan’s post, the LGBT group heats up. “This whole scene is really weird!” they shout. “You’re full of hate, full of fear!” Religious zealots bark back with fire-and-brimstone omens. Two girls make out in response – call them wide receivers for the offense. A Georgia State officer standing as part of a human dividing wall grins. Around us, aspiring preachers quote Bible verses; activists from San Francisco hold up signs that demand we STOP TRUMP; A teenager with a pink iguana named Fluffy hands off his pet to a suit-and-tie wearing blogger dubbed Mr. Doing Too Much, who proceeds to snap a photo featuring Fluffy and an officer from the Indiana Highway Patrol. “Do you really believe that?” he balks. In the center of it all, a group of girls laughs and seems to enjoy themselves as a man with slicked-black hair and Dr. Marten’s sporadically shouts at the zealots. I ask if he thinks any communication is getting across on either side. "Man, you ain't listening! All your talk is cheap. It's wrong!" It’s Wednesday, day three of the spectacle, and to much disbelief, Cleveland is still in one piece. One year earlier, a committee headed by Police Chief Calvin Williams and Mayor Frank Jackson sought out 2,800 out-of-state police from New Jersey to California and plenty of points in between. They joined other federal officers and the Cleveland force to help protect the city and keep the peace as part of the event's $60 million price tag. Over 60,000 hotel rooms were prepped along with thousands of Airbnb offerings in spaces otherwise vacated by anxiously fleeing residents. In Public Square, as Gilligan performs a card trick before two red-headed teenage boys and their father, a fight breaks out a few yards away, near the police line dividing the factions. Cops intervene, LGBT-ers back off and the scuffle peters out. For Gilligan it echoes an earlier scene. A reporter from NPR walks over with a camera and cuts off our conversation. “Can I see a trick, Gilligan?” he asks, glancing at the magician’s gold nametag. “You sure can,” Gilligan says, taking out his ropes. Around noon the same day, a black custom Boeing 757 jet flies over a crystal-clear Cleveland skyline. It is the only plane with clearance to do so on this day. Minutes later, a $7 million Sikorsky S-76 helicopter, outfitted with 24-karat gold-plated seatbelts and handles, descends on the Lake Erie shoreline before at least a hundred reporters and spectators who await its head passenger. “Ladies and gentlemen of Cleveland!” a man announces over a loudspeaker as the chopper’s blades slow. “Please welcome the next President of the United States – Donald J. Trump!” The theme song from the 1997 movie Air Force One blares. Trump walks out. To onlookers it’s clear that this is big. This is an important man. Outside the Q, merchants from as far away as Akron and Cincinnati hawk T-shirts and buttons that read “2016: I WAS THERE” predicting the future desire to prove attendance at the surreal scene. There are Trump bobble head dolls, Trump long socks, shirts with an open-mouthed “Crooked” Hillary Clinton. I ask a woman selling T-shirts on West 6th named Angela what she thinks of the election, as if her answer will soften the brass-haired man on every button. “The convention?” Angela says as if it's an afterthought. “I actually prefer to stay out of politics," she adds defensively. "I mean, I admire Trump for going from reality TV star to running for President, but I don’t know if I’ll vote for him.” I nod and thank her. I buy a bipartisan magnet out of sympathy. Sympathy for whom? I'm not sure. On the ride back home around midnight, I muse over Gilligan and conjure what I eventually dub Trump’s “sleight of hand,” recalling what Tony Schwartz, the ghostwriter of The Art of the Deal, concluded when he listened in on Trump’s business calls during research for the book. In my pocket, I worry at the magnet I purchased. Why did I really buy it? And while it wasn't really a question, right before the man of the hour was slated to speak in front of 35 million viewers, I wanted an answer. Even for this non-Republican, his words land in my gut like pounds of unused jet fuel or scrap copper. Trump seduces you, and you can’t help yourself. You begin to understand the gravitas of the Trump image, the sheer scope of its true capability and mass. In the manner he speaks, everything can be fixed and all trepidation will be alleviated. Then, as applause fills the area, balloons drop from the rafters and confetti billows in clouds of red, white and blue, there’s a fleeting period in which you really want to believe him, disregard his narcissism and visceral attacks, and enjoy for just one moment what you’ve been allowed to witness. But then you snap to. It's all a sleight of hand. 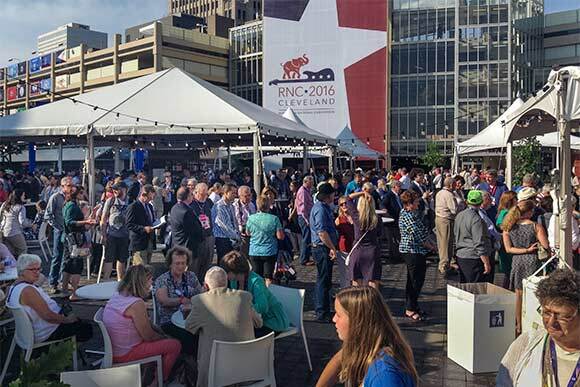 Read a roundup of Mark Oprea's live social media coverage of the RNC here.